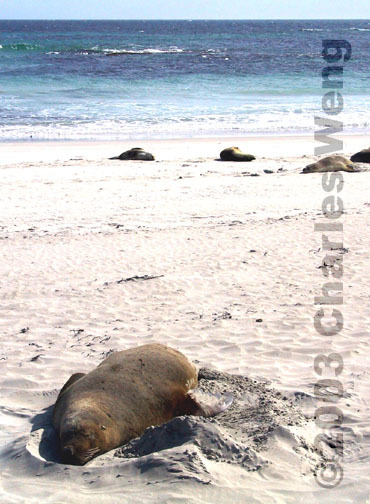 Seal Bay -- The endangered Australian Sea Lion, hunted nearly to extinction, is protected on this idyllic beach south-central of Kangaroo Island. Numbering no more than 3000 and scattered throughout the Australian coast, these creatures typically rest for much of their day to muster the strength of their long, deep dives for food. Visitors are careful not to approach them any closer than 10 meters, always staying in a group led by a park ranger.